I’m Jason from TronLive, before we begin this interview, can you give us a brief introduction of yourself and let us know what you do in Free Space. I am Dean Zaremba. I am the owner / operator of Free Space. I have BS in mathematics with actuarial minor. I have been a self-employed entrepreneur since the age of 19. Can you tell the audience what is Free Space and what have you been offering over the past few years? Free Space is an IT networking company, that has implemented enterprise LAN / WAN network for the past 20 years. We are based out of Reno, NV, USA. We have approximately 15 engineers on staff or under contract employment. We are always interested in new and cutting-edge technologies. As a result, in the past 12-18 months, we have been working with, learning and studying blockchain technologies. 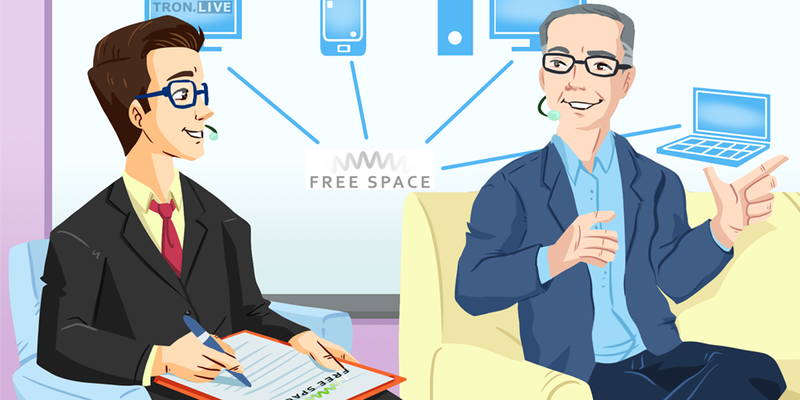 From an IT & Networking firm, can you let us know why does Free Space decide to join TRON SR? As mentioned, we have recently examined several blockchain projects. Tron has stood out because of its combination of technology and partnerships. And with is focus on dApps, we feel strongly that it is positioned as good as any coin in the marketplace. Additionally, we are impressed by the leadership team. The Tron Super Representative is a natural fit for our networking background. That’s good to know. In one of the posts you shared with us, you talked about the 4 big factors within SR models. Can you briefly explain that to us and why you think it is important? First and foremost, SR is a technology position. It requires excellent networking and sysadmin skills. SRs must be measured by this standard first and should be disqualified otherwise. The 2nd factor to any SR company is profit. We all need to realize that SRs must make money. And the compensation of the SR will determine the quality of organizations that apply to be SRs. Tron wants and needs the best, so we have to understand that we need to pay what it takes to attract the best. Finally, the SR plays a significant role in the Tron community, as it is an elected position. We feel there are two primary ways to give back to the community, the first is simply giving voters a portion of the TRX block rewards granted to the voters. And the second is to accelerate the increase of TRX price. We focus on the latter. So, in the end, every financial decision we make with our SR rewards must meet one of two criteria. Does it ensure the blockchain network stays up and running? Will it help the price of TRX go up? Thanks for sharing these in details. You also talked about how most people made mistakes by simply dividing 1 billion TRX by 27, which is the number of TRX rewards divided by the number of SR. This is one of the things that many people overlook. Can you elaborate on this so the community gets an idea of how it works actually? The 27 elected SRs will be paid 32 TRX per block they produce. A block will be produced every second and will be rotated between the 27 active SRs. In total, this equates to 1 billion TRX per year. But as a community, we don’t just want 27 SRs. The 27 is our starting lineup. We need dozens on the bench ready to step in at any time. If we settle on a fixed 27, then we won’t have any more than 27, because the remaining would not get enough rewards to stay in business. So, the best thing the voters can do is rotate about 50-75 companies in as top 27 SRs to keep the healthiest ecosystem. Then a single natural disaster, war, government intervention could not threaten the continuation of the Tron blockchain. This means that the compensation for most SRs could be about ½ of the default calculation method of dividing total rewards / 27. As a result, we feel many SR budgets and voter expectations of reward paybacks are not accurate. Thanks, this is something SR needs to plan carefully. What can Free Space do specifically to help the growth of TRON, can you share with us your short-term plan? First, is communication back to the voting community. Things change fast in the Crypto world, and sometimes information is scarce. We expect to be well informed on the day to day innerworkings of the Tron Foundation. We will pass our knowledge back to the voters on a weekly basis. Informed investors are more likely to hold their TRX, increasing the price of TRX. So, this expense meets one of our two criteria. Currently, Tron operates on the Ethereum network. On Independence Day, as we leave Ethereum, we also leave their network. So, we must build our own. To overtake Ethereum, we need to build a network from ground zero to that of a 100-billion-dollar company in only a few short years. SR candidates have funded their initial infrastructure out-of-pocket. As a result, most are single point of failure designs and under-staffed from engineering perspective. Initial funds, must be used to adequately build out, make redundant, provide 24-7 tech support to compete for the number 1 crypto coin position. We have committed to putting our first two million of block rewards back into network architecture and operations. We have put out a detailed network plan and network budget. We will build out our internal SR infrastructure to prepare us for Tron’s growth. After that, we plan to grow the SR ecosystem. We want to provide internships and best practices guides to aspiring engineers all over the world. Additionally, we will be holding contests for individuals that could not fund their own SR campaign and fund their servers and ISPs. This will not only groom the next generation of SRs but will also accelerate Tron’s global growth. Our long-term goal is to use each of these servers as our producing server for a day. So, that we can state that a block on the Tron blockchain has been built in every country on earth. We also want to build a public test network, so people all around the world can get comfortable building blocks with Tron software. In fact, this is already being started in conjunction with 4 other SR candidates. Cryptochain, CryptoGuyinZA, Sesame Seed, and Community node. That’s good to hear. What about the long-term goals of Free Space? What will you do differently when there are more resources available? It shouldn’t take long to get ahead of the game regarding the network, we are estimating one year. Especially, as the price of TRX rises. The key thing to realize is that the network operations budget won’t change dramatically as the price of TRX increases. So, while the price is low and in the early months, the network will be the primary budget line item. As the price of TRX grows, since the rewards are based on fixed TRX payouts and not USD payouts, revenues will dramatically increase. Tron will become like a maturing growth stock and can begin paying dividend to voters. I expect SRs to be able to pay out as much as half of their block rewards back to voters once TRX exceeds $1. Additionally, it is critical that reward payouts are trustless for the voters. Daily, votes will come and go for SRs, and their rewards will amount will change as SRs move in and out of the top 27. Any SR that tries to do this manual will struggle, and this could hurt the voters. Once Tron has implemented smart contracts on the network, rewards can be disbursed by them, so that voters are guaranteed to get the rewards that they were promised. Awesome. Will you have any future activities specifically to promote this TRON SR event and let more user know about Free Space? Marketing for the Tron project is invaluable, as it educates the public and brings more investors into the ecosystem. We will follow the lead of the Tron foundation in this area. Just as critical is a method to pass valuable information to the investors, which we will do via a weekly blog. But if you think about SRs competing against other SRs for votes, that does not benefit TRX holders. That is just money out of the ecosystem, with no real return to the voter. This might not be a winning strategy to get Free Space elected. But, as stated, we will only spend our TRX block rewards if it improved chain reliability or increases the price of TRX. Campaigning for votes, does neither, and thus is no good for the TRX investor. Also, along these lines, we want voting to be frictionless for the voter. We don’t think it is right that every SR has their own web page, telegram channel, reddit page, etc. It is not fair to expect the voters to have to go to all these different resources to learn about SRs. Therefore, we are only providing information about Free Space on centralized sites like Tronscan.org and Tronlive. We feel the voters should only have to look at one place, and the SRs should come to them on centralized platforms. Again, this might be a losing strategy, but sometime principal is more important. I think it’s good this is brought up front. In general, why do you think Tronics should support your team? What incentive does the community have? We have learned a lot about other SR candidates in the past 90 days. And we feel Free Space is filling a few huge holes. We have found most SRs have either sysadmin or developer backgrounds. So, our expertise in networking can help the entire SR community. From network architecture, design, operations, security, vulnerability testing, best practices, etc. We have heard many voters tell us that we stand out in these areas. Secondly, we find most SR candidates tend to fall into two categories, either very large companies or mom and pop operations. The concerns expressed to us by voters is that the large organizations may be able to vote themselves in, and thus not really have to answer to the voters, as you would want in a democratic voting system. But the same voters fear that some of the mom and pop organizations might not be able to handle the round the clock support that is needed to run a network operations center that is required. Free Space provides a perfect balance by being a mid-sized company. We have great technical teams and we manage money with a small-business entrepreneur spirit. And we have pledged full financial disclosure to prove it. Well done, you have these nicely summed up. Before we end this interview, is there any last words you would like to share to the community? We will operate based on the single-minded goal of increasing the value of the voters TRX like it was our own. Because it is, as we are stakeholders in TRX, just like our voters. The next generation of blockchain is going to migrate from transactions and smart contract to dApps. With so many blockchain projects now in existence and with the maturing of the market, value is no longer going to be speculative. It is going to move to actual adoption and use. The blockchains with the most users, will be the most valuable. So, active users increase TRX value, dApps bring active users, and network infrastructure brings dApp developers. So, building a worldwide network is the mission-critical foundation. That is why, as cliché as it is, our motto is If you let us build it. The users will come!